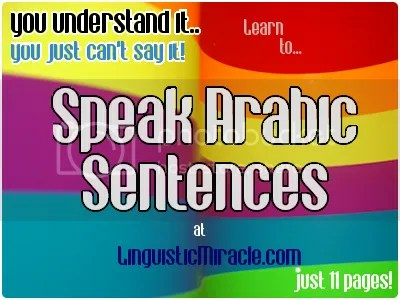 How to SPEAK Arabic – make your own Sentences! Get the mini booklet (only 11 pages), or read the Article. Who is this booklet for? It’s for people who can understand Arabic, but find it hard to connect words together to speak Arabic in sentences. Once you know how to make sentences, you can have paragraphs of discussion. This article hopes to get you started in that journey of talking Arabic with confidence, inshaa’ Allah. Start with bismillah, and enjoy. This entry was posted in arabic language.